A couple of weeks ago, I started a series of blogs around AR & VR. The first blog, “Back to the Future, From Aladdin to Oculus” was about Hollywood studios and the VR opportunities ahead of them. This week I will be talking about what AR could bring to studios and the film industry as a whole. I won’t be talking about how AR could be used within a movie, as it has been there for a long time, “Iron Man” using AR to visualize data in his helmet. AR Market projections are far more substantial than VR. The Digi-Capital Augmented/Virtual Reality Report expect the VR market to be $25 billion in 2020, while AR is likely to go above $80 billion. Today, Magic Leap announced $502 million Series D round, led by Temasek with participation from EDBI, Grupo Globo, Janus Henderson, Alibaba Group, Fidelity Management and others. It seems that those investors know something that we don’t. We know that AR is big, but we are waiting Magic Leap’s first product for a long time, at least now we know they have the money, no more excuses! With that in mind, studios, who own large libraries of IPs, could, with a blink of an eye, generate many objects, characters, scenes, and other elements from those assets. They can also build an AR application based on those elements— starting with basic games, all the way to AR interactive experiences and even to B2B applications. Generating AR objects is the natural step. Creating an AR application or experience based on those assets and IPs is what should be the focus. Pokémon Go was one of the early successes of AR applications that brought Pokémon to the real world — asking us to capture them and collect the most amount of characters. Well, it sounds simple, and maybe some will say “silly,” but no one can deny the success and the hype generated around the world. There is a simple explanation for that, it was entertaining and addictive, and what is required is an App on a smartphone. POKEMON GO crowds running to catch the poor creatures! Let’s apply that simple and “silly” model and apply it to Hollywood, as an example. The “Jurassic Park Trilogy” is one of the most successful franchises in cinematic history. Imagine if the dinosaurs roamed around the globe. Not only could you catch them with your mobile and have a collection of dinosaurs but Universal could build much more refined immersive experiences with all Jurassic Park characters, dinosaurs and even scenes. How about transforming Times Square into a Jurassic park on a certain day, and allow people to explore that virtual world while they are in the middle of New York! 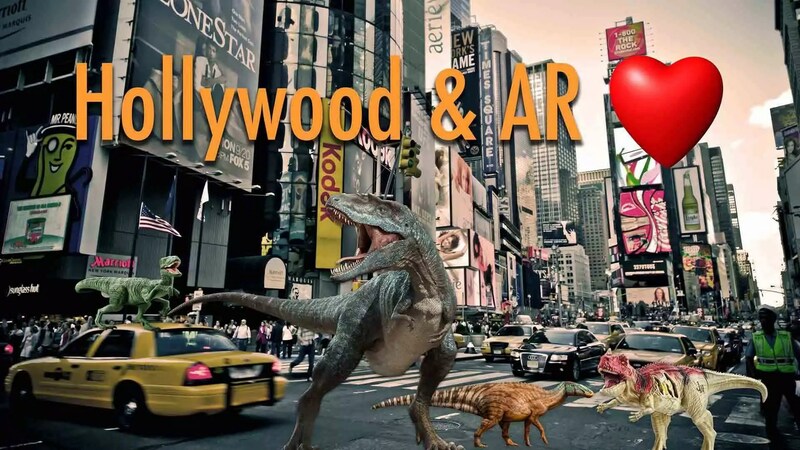 In around 240 days, Universal will be releasing “Jurassic Park, Fallen Kingdom” and I am sure an AR App could be a great marketing tool to build up the momentum before the release. Wait, I am going to stop my imagination right here? What if the Minions jumped out of Despicable Me to join the dinosaurs? Those examples are just the beginning and only targeting consumers On-The-Go. Theme parks can also be augmented to host new virtual experiences. Using smartphones is possible, but it is more important having the new powerful and capable AR glasses at parks that will enable premium experiences that could blow the visitor’s mind and empty their pockets. AR billboard and advertising, how about that? What it’s Like Making Movies with the HoloLens! I will leave it now to Disney and Universal and other studios to continue their AR plans as I am sure they have already started. I recently played the “Star Wars” AR Game with my son and had fun for over three days, jumping from place to place, collecting cards, and trading with others. If VR will take some years to become mainstream and generate return, AR is ready now, and the gain is immediate. The proof is the simple: Pokémon GO. VR needs a bulky device on your face, while AR could start with a smartphone or tablet, lightweight AR glasses such MIRA, or a more sophisticated one for B2B or location-based experiences similar to Microsoft HoloLens or DAQRI. On the software side, Apple released the ARKit, iPhone 8 and X that have more complex AR capabilities while Google followed with ARCore. My favorite is Wikitude’s SDK that serves as a simple way to have one installer for both Apple’s and Google’s kits along with some cloud capabilities that are much needed to build a good AR experience. Unity, Unreal and other creation tools are making AR creation more accessible on a daily basis. Hollywood, let’s do it! AR is NOW, and opportunities are endless. Talk to Apple! Or Talk to HoloMedia!